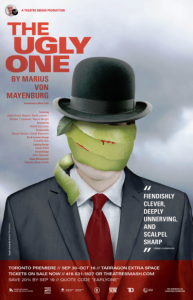 The Ugly One, presented by Theatre Smash at the Tarragon Extra Space, is the second German play I have seen in the last month (last month I saw The Underpants) and I am beginning to have a new found appreciation for the German style since my days of studying theatre at university. This is a very absurd and quick one act play that focuses on the story of Lette, an unspeakably ugly man, who doesn’t know he is ugly until his boss tells him. His wife is surprised as she thought he knew, so he decides to have plastic surgery and his face is transformed into an Adonis. His new looks afford him a new lifestyle, and so we are taught a lesson of the adage of being careful what you wish for as other people start to ask for the same face. The play is performed by four talented actors who all play dual parts, with the same costumes and even the same character names but are able to transform themselves with just the slightest of movements – for example, Naomi Wright, who plays Fanny the wife, just holds her neck in a certain way to reveal Fanny the rich old lady as a completely different character. The stage is stark and bright, and the lights are used to great effect as we move around the large boardroom table. The actors are all dressed in grey and black, and there are apples dotted around the stage and on the audience’s seats. I thought the way the actors were all present on stage whether they were in the scene or not was interesting. I loved how the gruesome surgeries are performed with accompanying sound effects into a microphone on the stage to wonderful groans of disgust from the audience. My only issue is that because they chose to perform the piece in traverse (where the audience is on either side) we sometimes missed some facial expressions which often got a laugh from the other side of the room. Although I recognize the advantages of performing in this way, it took on a Brechtian feel as he often liked to remind the audience that they were in a theatre which works with such a highly stylized piece of theatre. I am still pondering parts of the play – the use of the apples, the colours of the costume, and the fact that the actors interchanged characters so quickly in certain scenes – but it is a fascinating play that kept me interested. The actors were all highly talented. David Jansen’s Lette dramatically changed his body language as he went from ugly to handsome. Naomi Wright played the wife so well – from someone who thought her husband was a beautiful person to a woman crazed by his good looks – and her comic timing was perfect. Jesse Aaron Dwyre’s two Karlmanns were at times charming, weird and a little scary; and Hardee T. Lineham was an incredible presence on the stage, playing both the boss and the surgeon, Scheffler. The Ugly One does begin to speak to how we value ourselves and other people based on looks, and how we try to defy the aging process – sometimes with disastrous results. The play talks about how looks really are fleeting. If there is nothing more substantial than looks, then you’ll become easily confused with someone who looks like you because you won’t know who “you” really is anymore. The issues raised are hugely prevalent today. I believe people are often hired on looks alone and especially if you are in the sales field. The style of the play may be absurd, but unfortunately the subject matter is not. The play ran out of steam a little for me at the end. As my theatre date said, “It felt as if the writer had written himself into a corner and didn’t know how to get out of it.” I agree with that a little. It gets quite dark and even more absurd in the last 10 minutes, but the actors’ commitment to the piece kept me engaged right until the end. I love it when a piece of theatre gives you something to talk about, and The Ugly One definitely gave us conversation material. The audience was a bit sparse, so do go out and support this great company, and this interesting and different piece of theatre.